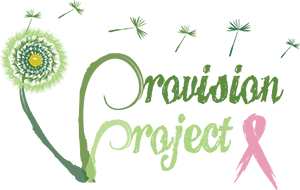 Provision Project is a different kind of breast cancer non-profit organization. You don’t see much pink on our website. Some. But not much. And that’s on purpose. Throughout the years, the pink ribbon of breast cancer has become a synonymous symbol of breast cancer. In October, the country turns pink. Commerce turns pink. Even the NFL turns pink. We’re very grateful that there is so much awareness of breast cancer in the United States, and that awareness has undoubtedly saved thousands of lives because women are reminded to do self-exams and mammograms. The leadership team at Provision Project has intimate knowledge of breast cancer. All of our board members either have had breast cancer or have had a loved one fight it. Most of us are part of a large online breast cancer support group that I founded in 2012 where we learned firsthand that many of our sisters are fighting another battle on top of breast cancer. It’s a financial battle. It started innocently enough. One of the gals in our support group asked us to pray for her. She needed to decide whether to pay her co-pay for chemo the next day OR to pay her electric bill, which was overdue and about to be disconnected. Thankfully, some of the women in our group rallied around her and found the funds to make both things happen. But that wasn’t the only situation we heard about. We painfully learned that women with stage 4 breast cancer never stop treatment … if one treatment stops working, they start a different protocol. How can a family be expected to keep up with the deductibles, co-pays and their regular bills for the rest of their lives? Especially when one of the family’s breadwinners is fighting for her life and either has to cut back on work hours or can’t work? We all became aware that financial devastation is often a side effect of breast cancer treatment that no one talks about. And that’s not right. Renee changed her address to Heaven in November 2014, leaving Jacob and her two young daughters behind. Jacob challenged me to start a non-profit in Renee’s honor, and Provision Project was born. Why call it “Provision Project”? Because we’re providing for the most basic of necessities. That’s it. Every human being deserves to have food, clothing and shelter. But the breast cancer fighter also needs deductible payments, co-pays, prescriptions, gas to get to treatment and other basic needs. Often there just isn’t enough money to make all of those “basics” happen. Jacob is a graphic designer, and it only seemed right that he would design the logo for Provision Project. We didn’t give him any ideas about what to create, but when he came back to us with the current logo, we knew it was The One. We loved Jacob’s idea, and we also loved the idea of having a “not pink on purpose” logo. Our logo is the colors of life. We are helping women live with cancer. Remember being a child and picking a dandelion that had gone to seed? What would you do? You’d blow it into the wind and make a wish. Provision Project likes to think of those seeds as seeds of hope. The women we serve need hope. They need financial relief. They need to know that someone cares about them and their fight and will help them get through it. They need Provision Project.